When the Uphill Trust came into being, Uphill Junior School comprised a wooden building on a rented site in the centre of Iruhuura Trading Centre. It soon became clear that one of the first priorities for the trust would be to find a permanent site for the school, and the hunt for suitable land was begun. “The Uphill Trust is delighted to announce that a plot of land has been purchased in Iruhuura village on which Uphill Junior School can construct permanent school buildings. The current wooden school buildings are on rented land in the centre of the village and this has limited the development of the school and its facilities. 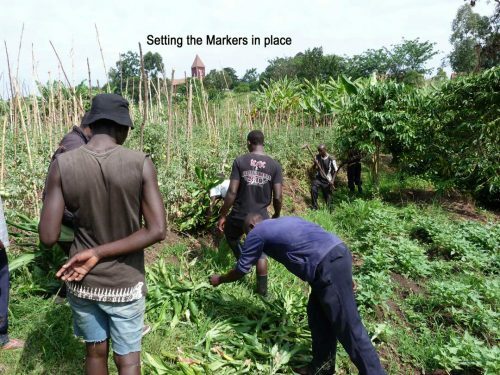 The plot is in a good location, close to the main village amenities, and is currently home to annual crops and matoke banana trees, both of which will be removed at the end of the growing season. The photograph above was taken from the top corner of the plot, which is bounded by the tracks to left and right. The site was surveyed by the Chairman of The Uphill Trust prior to the land transaction and, on Land Purchase Day, all the interested parties walked around the site in a large group discussing exactly where the boundary positions lay and marking them with a special marker plant that is always used for this purpose in rural land sales. That done, the transaction could take place. 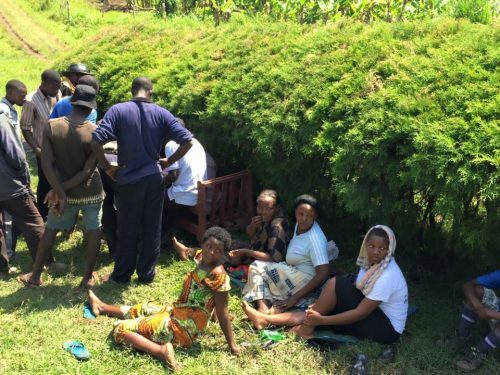 As ever in Uganda, the men were actively engaged in the administrative process, whilst the ladies waited patiently for matters to be concluded! The Director of Uphill Junior School already has a good idea about how he would like the new school to be laid out and, based on his quick sketches on the day, a simple layout plan has been prepared to help with the next stage of the fundraising process. 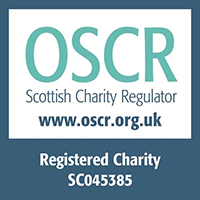 The first plot of land was bought on 29 June 2015 and was funded by a legacy donation and a grant. Early in 2016 Elius was approached by one of the Uphill parents who owned land adjacent to the new plot – he needed money to pay for his children’s secondary school education and asked if the school wanted to buy more land. As it was already clear that more land would be needed to accommodate all the classrooms and other building needed for a primary school with kindergarten, the offer was accepted and the trust bought the second plot on 24 March 2016. The same offer for an additional plot was made the following year – the land owner’s daughter was now off to university – and this purchase was made on 3 February 2017. 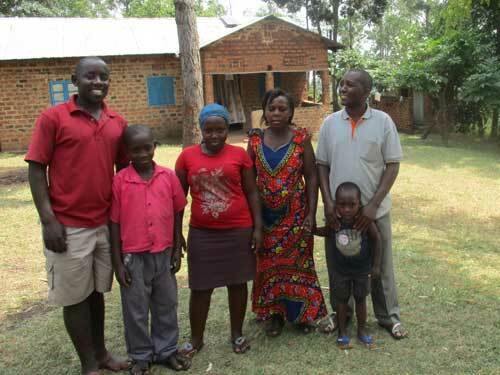 Elius on the left of the picture, with the family who sold land to pay for their children’s education. UPDATE MAY 2018: Another plot of land adjacent to the current school site became available for a quick sale by a family who were experiencing financial difficulties. We were happy to be able to help them whilst securing a valuable site for future development on 23 May 2018. 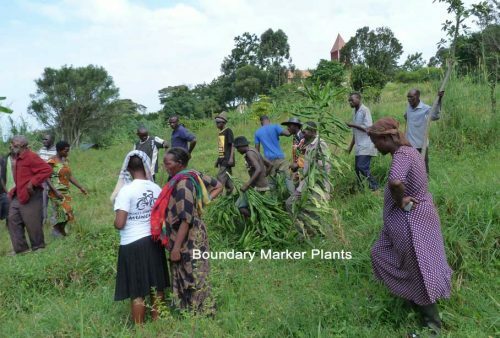 UPDATE JULY 2018: Plot number 5, which lies adjacent to the fenced in school site and the new plot purchased in May, was offered to Uphill by the Church of Uganda. A price was agreed and the sale took place on 15 July 2018. Uphill Junior School now has enough land to accommodate all the necessary buildings for the time being, and three families in Iruhuura have been able to release funds from their capital assets. Win-win all round.